The organisers of the Gold Coast Commonwealth Games are on a damage control campaign this morning as viewers and commentators expressed their fury at last night’s coverage of the event’s closing ceremony. 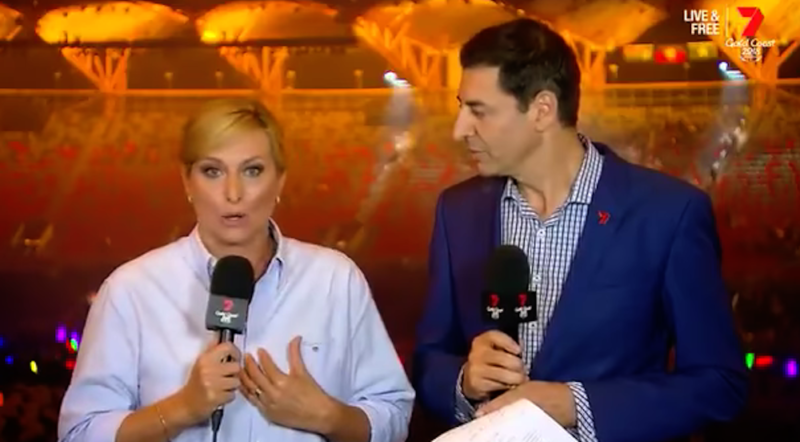 Channel Seven’s broadcast team were particularly scathing of the event which saw the ceremony start with the athletes already in the stadium rather the teams entering the stadium during the celebrations. “You’re being way too polite,” replied fellow commentator and former Commonwealth Games athlete, Johanna Griggs. Host broadcaster and operator of the event’s International Broadcast Centre, NEP Group, were quick to deflect criticism from its coverage. This morning, Commonwealth Games chairman Peter Beattie went to air on Seven’s Sunrise program to issue a mea culpa to both the broadcaster and its viewers, explaining the coverage flaws were due to staging decisions by the Games’ organisers and event organisers, Jack Morton Events. The events management company is part of the IPG group and leading its organisation of the opening and closing ceremonies was David Zolkwer, head of Jack Morton Worldwide Public Events. Zolkwer previously led the event teams for the Athens 2004 Olympic Games and the Manchester 2002, Melbourne 2006 and Glasgow 2014 Commonwealth Games. Mumbrella has contacted Jack Morton Events for comment. In a statement, the Gold Coast Commonwealth Games organising committee acknowledged it had made a mistake and emphasised the good intentions of the event’s creative team. The Gold Coast 2018 Commonwealth Games Corporation (GOLDOC) acknowledges the concerns raised around tonight’s broadcast of the GC2018 Closing Ceremony. We agree that the ceremony should be a celebration of the athletes and a chance for them to celebrate the end of 11 days of tremendous sport. It was the intention of the Closing Ceremony creative to have the athletes involved from the very start of the show, enabling them all to be part of the celebrations. This resulted in the athletes entering the stadium during the pre-show, rather than during the live broadcast. GOLDOC appreciates that this decision therefore did not provide the opportunity for the television audiences to share this moment. With over half the athletes scheduled to depart the Gold Coast tomorrow, it is understandable that large numbers of athletes chose to depart the ceremony early, to prepare for their journey or attend their own team celebrations. It was the intention of GOLDOC to celebrate the accomplishments of the athletes and provide them with a great experience. We are naturally disappointed that the good intentions of the creative did not necessarily work for some of the athletes involved and the broadcast audience. “Over the past three years, Jack Morton Worldwide, Australia has had the privilege of working side-by-side with GOLDOC in the development of the creative elements of the Opening and Closing ceremonies of the Commonwealth Games. “We’re the Australian rights holders so we can only provide the pictures provided by the host broadcaster.” And who were the Host Broadcasters? Sunset + Vine, NEP and (guess what) the Seven Network!!!!! Yes, it is unusual for the local rightsholder to be part of the host broadcast group, but this was the case on the Gold Coast. So Johanna Griggs flamed her own bosses. Don’t let the organisers dodge their way around this disaster. The ceremony was just trash from beginning to end. Whoever paid the IPG people should ask for their money back. While the exclusion of the athletes was a tragic decision and must never happen again, the TV production was a disaster … just horrible. Sound was poor, lighting abysmal, poor focus on the acts, dancing when it wasn’t needed. When compared with the brilliant GC opening ceremony it was a disaster. Channel Seven must take some responsibility for not showing the athletes entering the arena. It was pretty clear that Seven gave priority to showing MKR to keep the audience away from the The Voice return. According to Sunday Oztam ratings, it worked to the tune of 220,000. Aside from not seeing the athletes, there was far too much self-indulgent jingoism. Boring. The missing athletes issue is but a sideshow. The ceremony – like the opening ceremony – was an embarrassing disgrace. Amateurish, slow, suffering from PC-strangulation at the expense of professionalism, at the expense of understanding audiences, resembled a school speech night – and not a good one either. This is what happens when an organising committee run by a foreigner who has no understanding of Australian history and culture makes the decisions. It happens when an American company is appointed, who in turn appoints a Manchester-based, English creative director to try and represent Australian to the world. It happens when $30M is spent without spending anything on professional talent. To call both opening and closing ceremonies a train-crash is being too kind. Agree totally with comments Mike, but as I am still fuming about missed sleep waiting for athletes to come in, I feel you are being too kind. Heads should roll about this debacle!!! The chief organiser should NEVER be given a public position again. I hope the athletes had a great party after they left the stadium. Absolutely discrasfull that the athletes where not allowed into the closing ceremony. We as a nation are losing credibility fast when we cannot make the right descisions on how to run events. Having run a large and successful resort on the GC for 10 years I understand the value of positive marketing for the GC the broaden the market mix. The opening and closing ceremonies are a focal point and Peter “Apologies” Beattie head of the organising committee wasted the stakeholders investment badly – good luck ARL !! Colleagues on the GC in the industry said “Apologies Beattie” and the “dis-organising committee sent the investment up in smoke !!!!!! Seriously Helen Garney, are you for real releasing that press release? Cast your mind back to the Opening Ceremony. That was also a production and creative disaster orchestrated by your American Company. One thing we all agreed at work today was how sick we all were of the overuse of the same old D-List Australian singers and performers. Kate Ceberano and co – NO ONE is interested. We’ve all seen these people ten thousand times – they’re tired, and they never learn any new tricks. And the international viewers don’t know them at all. Both the opening and closing ceremonies were a poorly run rock concert, absolute disgrace. The organisers should never ever be allowed to get near anything again. The music and singing was terrible the dancers poor. The Aboriginals had so much air time, yet they protested, held up trams etc etc and and it was ugly and the protesters were allowed to stay at the spit, an area that closes at eight pm and fines imposed. They had a licence to protest. Funny how badly behaved families are allowed to stay there. Neither of the ceremonies will do nothing for the Gold Coast much less Australia. Yet we cannot find out who they are or where they are from. Is it another time when Australia does think we are good enough to do our own ceremonies. Look back to Sydney Olympics, Brisbanes Commonwealth games. Best NOT TO EVERY ALLOW OLD POLITICIANS NOR PUBLIC SERVANTS RUN ANYTHING, THEY ARE NOT EVEN ANY GOOD AT SPENDING OTHERS MONEY. As a part of the technical events services industry, and also part of a group of MANY local concerns that lost out on tenders to international/interstate bidders, I have to say……we saw this coming a mile off. State offices were contacted to challenge the decision to hand over the creative reigns to foreign entities over the likes of proven live production talents like Ric Birch. Responses were dismissive and sighted a illogical experience advantages that JMW had over other Australian bids (Google Ric Birch). This is not to mention that a VERY large percentage of the event production equipment and crewing for the ceremonies AND the sporting and festival sites were also farmed to overseas/interstate concerns, with similar ‘illogical’ reasoning as to why locally or even nationally based companies (with proven track records in putting on world class productions) were not considered for the ceremonies. It’s not lost on those involved in production tendering for this event that there was something ‘off’ about the whole process from initial specification delivery to the awarding stage. Delays that went on for months and tenders being awarded to entities which seemed to defy all economic logic were pretty much common knowledge throughout the industry. Both ceremonies were always going to be what they ended up being. No local connection, understanding or soul, little in regards to local technical crew and equipment, bloated hierarchies being headed up by an egotistical apology junkie. All of the people, know how and experience was offered, and for some reason that defies explanation, not used. Anyone who has worked agency side on large scale events like this knows that every facet of the ceremony needs to be signed off by the client. It’s easy to throw the agency under the bus. but the reality is that someone, somewhere within the organising committee must have approved it.